Tyler came to our practice with his mother as a new patient because he had been forwarded one of our blog articles highlighting a patient with a very similar story. Tyler was born without an upper left lateral incisor tooth. He had recently completed orthodontic treatment. During orthodontic treatment, a “fake” tooth was held in place by his orthodontic wires. But, he and his mother were looking for more permanent options to replace the missing tooth as the flipper/retainer he had fabricated after his orthodontics was not comfortable to wear and he was concerned about his friends noticing. Tyler had just recently completed over 5 years of orthodontics and wanted to feel more confident about his smile after investing so much of his time and care with braces. He and his mom were looking for an option that would give him a natural look that can last until he is finished growing and can have an implant placed to replace the tooth. He was also interested in brightening his smile and discussed several bleaching options with Dr. Elizabeth as a part of his treatment. After doing a comprehensive exam and bleaching consult, Dr. Elizabeth recommended a composite veneer for his right side lateral incisor (since it was undersized) and a composite bonded bridge to replace his left side lateral incisor. Tyler had impressions of both his upper and lower teeth taken so that Dr. Elizabeth could complete a mock-up of what the results would look like. This gave Tyler and his mom the confidence to move forward with the treatment. Tyler also decided to proceed with ZOOM whitening and bleached his teeth in one day before the restorations to make sure he had the perfect shade for his pearly whites! Bonded restorations like Tyler’s can be placed in just one visit. The procedure took Dr. Elizabeth a little over one hour as she custom-designed his new teeth and made sure they fit into the harmony of his bite. As extra protection Tyler also decided to have essix retainers and an athletic mouth guard made to keep his smile well protected and looking its best. Tyler and his mom were very happy with the results. They thought everything looked natural and were glad to find another option for him! Tyler is happy he no longer needs to wear the flipper/retainer all the time and feels much more confident in the color and his overall smile. He thinks it was a great solution for him and highly recommends it to anyone considering this treatment! Crowns vs. Veneers: Which Smile Solution Is Right for You? Tooth trauma—it happens. 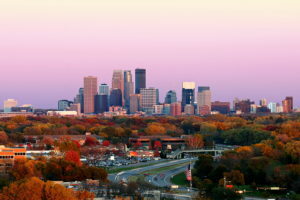 Whether you’ve cracked a tooth playing lacrosse or need to fill a cavity from chowing down on too many treats at the Minnesota State Fair, you’re not alone in the need to address weak, broken, or painful teeth. Eggert Family Dentistry often recommends crowns or veneers to patients suffering from tooth traumas. But what’s the difference between these two procedures? How do you know which one is right for you? 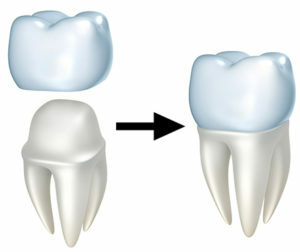 Dental crowns have been a dentistry staple for decades. A crown helps you recover your smile after a tooth decays, cracks, weakens, or becomes discolored. 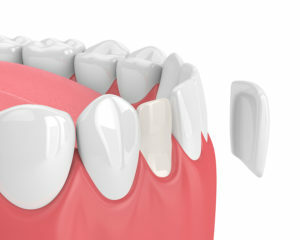 Sometimes, filling or bonding a tooth is not enough for you to chew comfortably and confidently. In this case, we may recommend a crown. A crown is a porcelain cup that fits snugly over your tooth. Installing one takes one or two visits. On your first visit, we’ll reshape your tooth and take dental molds. Sometimes, we can use our CEREC equipment to scan your tooth and make your crown in-house. If this is the case for you, we can install your crown the same day. Otherwise, we’ll send the mold of your tooth to a dental lab. We’ll ask you to come back in a couple of weeks to install the crown once it’s ready. We’ll use cement to secure the crown to your tooth, and you’ll be good to go! Dental veneers are a great way to recover your smile when several teeth are cracked, weak, misaligned, or chipped. A veneer is a very thin, ceramic shell. It covers your entire existing tooth structure, not just a single tooth. Once installed, veneers look and feel just like your natural teeth. Veneers take two to three visits to design and install. In your first visit, we’ll discuss the smile shape and look you hope to accomplish with your veneers. 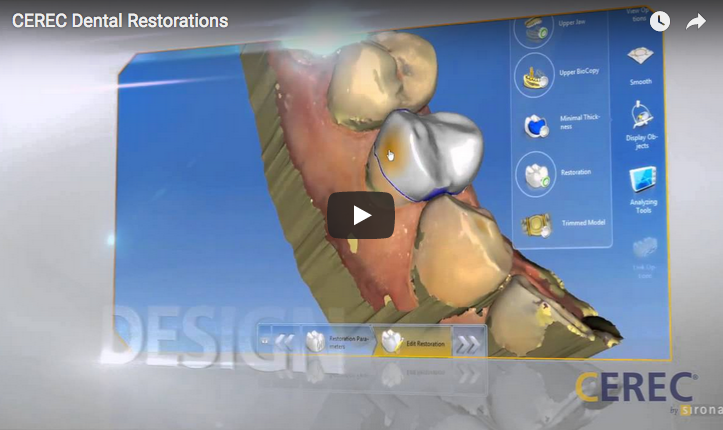 Then, we’ll prepare your teeth for placement of the veneers and take molds. We’ll send the mold to our dental lab for fabrication, which takes two to three weeks. In the meantime, we’ll offer you a temporary solution you can wear while your veneers are custom made. At your last appointment, we’ll bond them into place. You can start flashing your new smile immediately. If you’re a candidate for crowns and veneers, Dr. Elizabeth and Dr. Jeff will explain the difference between these two smile solutions and give you their professional recommendations. 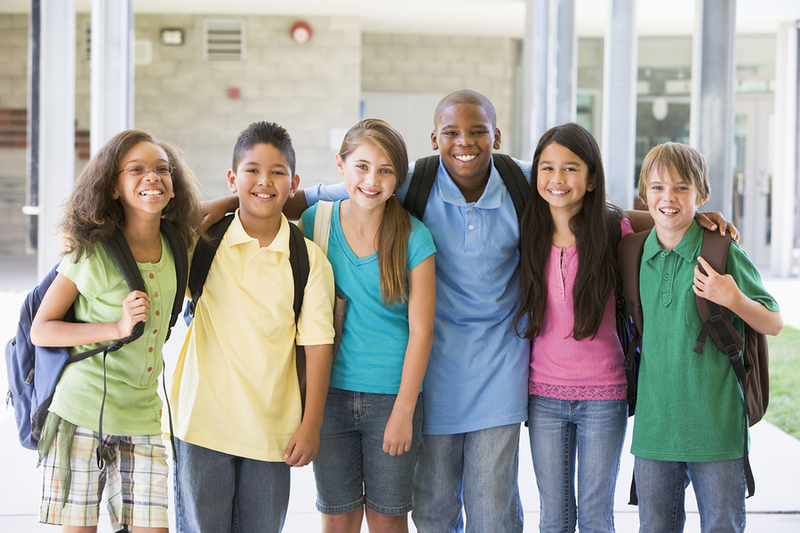 Typically, we’ll recommend crowns for patients who have one or two troublesome teeth. Veneers are a better solution for patients struggling with multiple issues on multiple teeth. Wondering if a crown or a set of veneers is something you need? 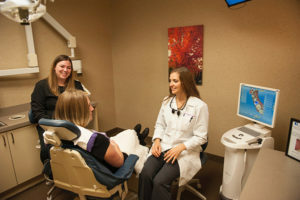 Schedule your appointment with Eggert Family Dentistry today. We can help you decide healthiest, safest, and most comfortable way forward. Posted on August 17, 2018 August 29, 2018 Categories UncategorizedLeave a comment on Crowns vs. Veneers: Which Smile Solution Is Right for You? Chauncey had white spots on several of his front teeth for as long as he can remember. Typically spots like these are caused by orthodontic work but can be a developmental characteristic too. He researched online about different procedures available to treat the spots and found our You Tube video about the Icon procedure. After doing extensive research he decided to give us a call! The white spots were very visible whenever he talked or smiled. Chauncey wanted a more consistent coloring in his teeth so the white spots no longer distracted from his beautiful smile. He wanted a procedure that would give him good long-term results that didn’t require re-treating the way many bleaching treatments do. He also liked the non-invasive manner of the ICON procedure. Icon is a great way to resolve white spot lesions because it requires no tooth removal or Novocain and is very conservative. First, we isolate the teeth and tissues. With a simple cleaning solution we rub on the teeth to start the spot removal process. The Icon infiltrate is then rubbed on to the surface of the teeth and cured with a light. The Icon infiltrate and curing light is then completed a second time to ensure a protective seal on the teeth. The surface is smoothed with a polishing paste and other polishing instruments if necessary. It’s really that easy! Chauncey was uncertain before having the treatment completed and did a lot of research on his own about the results and process. He says he is, “Very happy, and surprised and how well it worked!” He would tell anyone considering this treatment to go for it. Chauncey was very excited about being able to get same day results and feels much more confident in his improved smile! If you’d like to experience this treatment for yourself, contact us today! Laurie had an existing bridge for her upper front teeth for 35 years and felt it looked dull and didn’t fit quite right. With her son’s wedding planned for April of 2017, she started looking into her options to improve her smile before the big day. Dr. Elizabeth spoke with Laurie about her concerns related to gum recession, bleeding, and darker margins with the existing bridge. They discussed the timeline needed in order to make improvements before the April wedding and decided that taking complete records and formulating options for treatment was the best way to start. Laurie wanted a brighter and more natural looking smile. She had considered implants in the past but had been happy with her existing bridge so the time needed to complete implants didn’t seem necessary. The existing bridge was causing gum related problems and the fit wasn’t quite right after the many years it had been in her mouth. 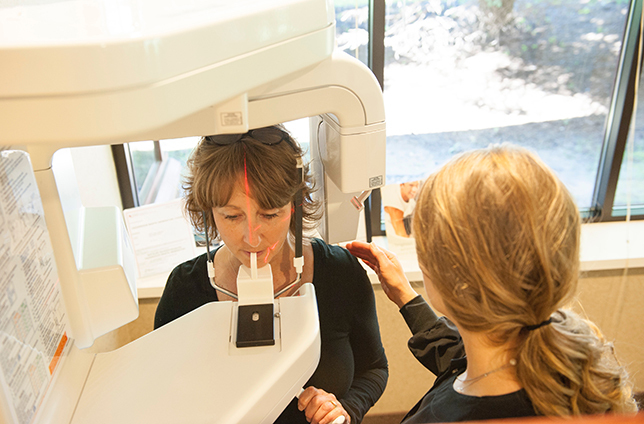 Laurie had also been experiencing issues with migraines for years and was open to exploring options that might improve her jaw function and ultimately improve her health. Dr. Elizabeth recommended that Laurie start with full records so that she could asses the current health of the teeth and gums, and the function of her jaw and muscles. After the records were taken Dr. Elizabeth was able to formulate the best available options to address all of Laurie’s concerns. Ultimately Laurie and Dr. Elizabeth decided the best option was to start with splint therapy, using an anterior deprogrammer. Laurie also wanted to have custom bleaching trays fabricated and then replace the existing bridge to match her brighter teeth. Laurie wore her anterior deprogrammer for 8 weeks and started bleaching prior to doing impressions for the new bridge. She noticed after the first 3 weeks of splint therapy that her jaw felt looser and her teeth felt more in place. By the end of the 8 weeks, she noticed her migraines had decreased so dramatically that she hadn’t had headaches in a month and she was sleeping much better at night. Dr. Elizabeth took impressions for her new bridge and sent them to the dental lab for fabrication. Laurie then went in to Edgar Jimenez’s Dental Studio for a custom shade appointment so they could ensure she would be happy with the end result. After 4 months of planning, preparation, and treatment we were able to place the new bridge in time for her son’s wedding! Laurie loves her new smile and said that it exceeded her expectations! She was skeptical about the splint therapy at first but now she has few if any migraines and has a hard time sleeping without her, now full, splint. The records process was an interesting experience and she enjoyed learning so much about the function of her mouth. Laurie says, “The doctors really know what they are doing. Dr. Elizabeth made it really easy.” Laurie feels much more confident about her smile and is surprised with both the improvement in her gum tissue and the natural, bright looking results we were able to achieve. Congratulations to Laurie on her beautiful new smile! If you’re interested in tooth replacement options including bridges, please contact Eggert Family Dentistry today at 651-482-8412. The Seattle Protocol: It’s not an action flick coming soon to a theater near you. But it is something that could save you from a restless night’s sleep. At Eggert Family Dentistry, that’s something to get excited about! While there are six steps in the Seattle Protocol, you may not necessarily go through the entire process. The purpose of the protocol is to help us understand which step provides the best relief. Typically, the further you progress in the process, the more help your airway needs. If we find that you only get positive results in steps 4, 5, or 6, then looking at oral surgery options to expand your airway might be the best long-term solution. Luckily, here in North Oaks, we are able to set you up with some of the best local orthodontists and oral surgeons to manage your situation. 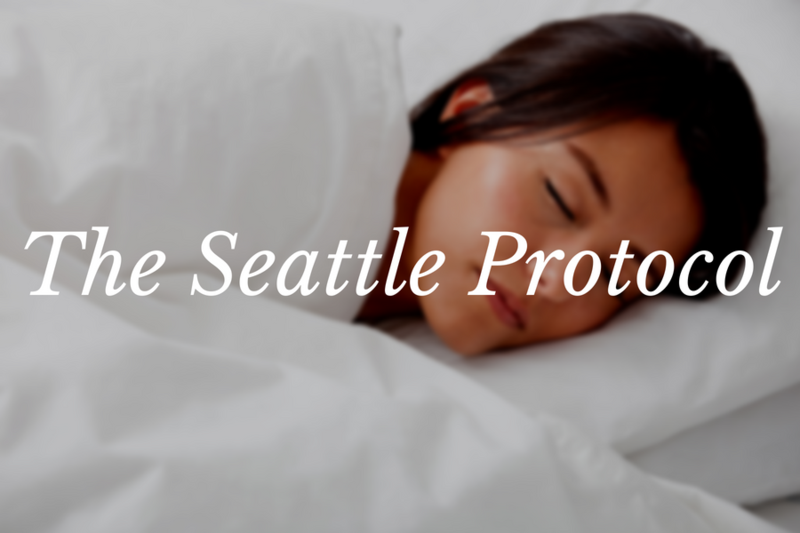 The Seattle Protocol is a gradual, gentle, and reversible process that helps us identify solutions for our patients with airway issues. 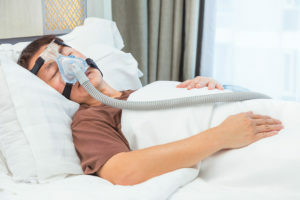 It not only can help you get a better night’s sleep, but it can lead to an excellent path to better overall health and wellness. If you snore, spend your nights tossing and turning, have anxiety or depression, have acid reflux, or just simply feel tired all the time, call us to schedule a consultation, 651-482-8412. We may recommend starting with the Seattle Protocol to help improve your life!